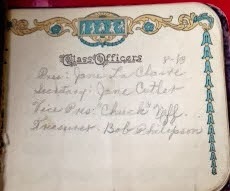 ast week I discovered my mother’s school autograph book from 1933. First, I learned that she was the class secretary. (Ironically, she spent most of her life working as a secretary/office manager.) Since she was born in 1923, she would have been around 10 and probably in 4th or 5th grade. 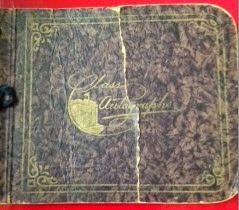 The autograph book contained brief messages and signatures by friends and family. Fortunately, many of the notes were dated. 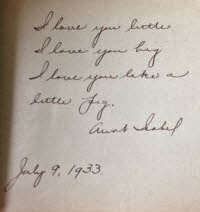 On July 9, 1933, a number of relatives signed the book. Perhaps there was a family event, and my mother took the opportunity to gather signatures. I can almost visualize her walking around with her autograph book asking people for signatures. Aunt Isabel – I believe that this would have been Isabel CUTLER Evans, my grand aunt. Gramma Cutler – This was surely my great grandmother Nellie (Helen) Amelia MARSH Cutler. Uncle Wayne – This person is a mystery. He signed the book on the same day as the other Cutler relatives, so I assume he is from that side of the family. However, I do not have a Wayne Cutler in my tree. 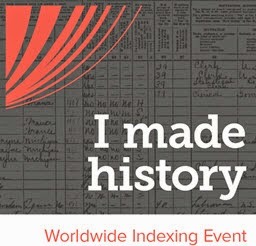 I have a Wayne Hills, husband to my grand aunt, Dora Agnes TAYLOR Hills, who would have been living at that time. I have a Wayne SPAULDING, but he was a cousin. It is conceivable that someone who was a cousin would refer to himself as an uncle. Perhaps Wayne was a nickname or maybe this Wayne is a person as yet undiscovered. 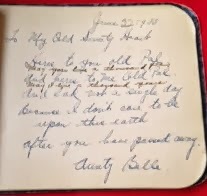 On June 22, 1933, there was a signature by Aunt Belle. 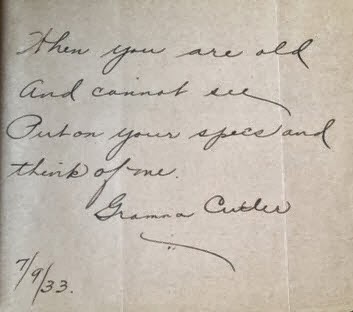 This was no doubt the signature of my grand aunt, Isabel WILLIAMS Hamlin. “Aunt Belle” was the way my mom used to refer to her. There were also two signatures (in what appears to be the same handwriting) by my Welsh great grandparents, William WILLIAMS and Jane OWEN Williams. They did not write messages, and I believe that might be because English was not their native language. I think William may have written Jane's signature, as I don't believe she ever abandoned her Welsh language. Although they were somewhat corny and traditional, I loved reading the messages written in this book. 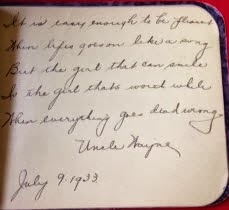 If my mother only knew that her autograph book would be a genealogical treasure almost 100 years later. Dover Publications, Inc., Mineola, New York, Electronic Clip Art, 1200 Ornamental Letters, 2007.